← A revolution on the scale of Stone Age to Iron Age or greater? I have written before about the purpose of coaching not being about actions or solutions. This seems counter-intuitive to most people involved in coaching who seem to focus on coaching in terms of taking actions to achieve goals. Talking to my friend Steve today he was reminding me of this having just read the work of Sydney Banks. He felt what he was expressing about the principles of mind, consciousness and thought fitted closely with what he had learnt and shared with Chrissy and me over the years. Our conversation moved on to talk generally about coaching and the issue of not focusing on action. This also got me thinking about a model I came up with seven or eight years ago for thinking about what is going on when we are trying coach people or trying to help them. In 2001/2002 I was working for Ernst & Young at the time that Enron collapsed, Andersens folded and the Dot com bubble burst. As the impact of this hit the accountancy industry I was in a prime position to watch how Ernst & Young reacted. What I noticed was that the focus on control increased greatly, with leaders throughout the business keen to measure everything that they could as often as they could. I also watched the way that the focus went very narrow and very short term. People also started to talk about things in a very black and white, judgmental way. Thinking about it I began to see that the impact of fear was to make our focus go very narrow and short term and to reduce our options to one of two variables. It occurred to me that if you are about to be attacked by a tiger you want a very narrow focus – you don’t want to be distracted by things in your peripheral vision or to be considering what a beautiful little bird there is on the branch up there, I haven’t noticed that before – not much use to you when you are about to be eaten. At the same time, carrying on the tiger theme, you also don’t want a long term perspective, it really isn’t helpful to be considering what you will do once you have dealt with the tiger and perhaps planning for your next holiday. Lastly you don’t really want a range of complex and interesting options to consider, you want as few as possible, in essence fight or flight. So the core brain, being geared up for survival takes over whenever we feel under threat and puts us into survival mode. This is fine for a situation of real physical danger, however, it doesn’t help in most of the situations that we face where our physical survival is not threatened and critically it does not allow us to learn, only to react instinctively. My experience is that when we are stuck in a black hole or grappling with a difficult conundrum, it tends to trigger this survival response. We find ourselves thinking narrowly, short term and in somewhat black and white ways. We generate a tunnel vision and since none of us like negative emotions we want to get away from whatever is causing them as fast as possible. Most of us experience the fact that when we share our situation with others and they help us, we say it is back in proportion or perspective. What does this mean? As far as I can see, it seems to mean that our perspective has broadened out to see the situation more fully or clearly. Edward De Bono talked about the fact that the creative faculty of humans is centred in their ability to think asymmetrically. He described the way that we make breakthroughs. His premise was that we do not make breakthroughs by continuing logically from our current premise. The only way we make breakthroughs is by shifting our perspective to a new position. In order to do this De Bono felt we needed a PO – a provocative operation. This provocative operation prevents us from being able to think about things in our habitual way and causes a shift in perspective. His point was that once we see a situation from a new perspective, we can immediately see how it links to our current perspective but we cannot get to this new perspective by starting from our current one. He used our sense of humour to illustrate this. When we tell a joke, the punch line isn’t obvious to us, indeed we might struggle to have any idea what the punch line will be, yet when we hear it we can immediately link it back to the thread of the joke. It is the same with a riddle. It seems to us impossible to answer, yet once we hear the answer to the riddle we can usually see immediately how it connects. At the same time it requires a leap or shift of perspective to make the connection. Shock comes – oh! oh! Laughing words – ha! ha! So like De Bono, there seems to be a humour connected to this. Initially when events do not go the way we planned we are shocked or frustrated, often full of fear but then once we have composed ourselves we can manage to laugh at our discomfiture. My son Luke is an Aries; it is to his eternal credit that he seems to have a wonderful natural ability to laugh at his own discomfiture. When he finds that events or situations have confounded him a grin spreads naturally and easily across his face (I am similar, a grin spreads across my face too, but mine is the result of years of hard won practice!). When we watch people struggling blindly in a film or book and then suddenly being confronted with the consequences of their blindness we laugh. Much physical humour and slapstick is based on this premise, the greater the contrast, the greater the humour – a pompous man in an impeccable suit, slips on a banana skin or farts by accident in an important meeting and we are amused. In coaching, I notice that when we get to the real issue for an individual, or they see what they are really stuck on, they can’t help grinning, even if they try not to. It is connected to Mars again because when you get to the truth of the real emotion we can’t seem to help smiling. Humour is also interesting in that it is only possible to have a sense of humour when we are less identified with our personalities and their dramas; when we are taking ourselves less seriously. This is not possible when we are in the grip of our fears and our focus has become very narrow. In many coaching situations or in helping people, the point is not to solve their dilemma but simply to help them to see it differently; to become less identified with it. When we are stuck in a situation, we are in a black hole, there is a gap between how we want things to be and how they are. In this pass our mind tends to circle endlessly round the same options. Simply developing the ability to laugh at our situation and how we are stuck is often the most valuable starting point and may be enough. The I-Ching hexagram Shock says that the superior man examines his heart lest it bear any secret opposition to the will of God. I don’t know whether the Chinese original actually talks about God. This may be Richard Wilhelm’s interpretation as a Christian missionary. It might be more literally translated as the Universe or the cosmos. In this sense, the I-Ching is describing shock as being a situation where we are fighting against the nature of life, ie. we have a fixed picture about how we want things to be or think they should be which is opposed to the way that things actually are. Seeing this means we can shift our frame of reference to accept the nature of reality rather than seeking to impose our own frame of reference. And finally, for those of you still with me (I have Neptune square my Mercury in Sagittarius in the 12th at the moment so an already circuitous and tangential Mercury is struggling to coalesce into a coherent thread), back to the model I was indicating earlier. 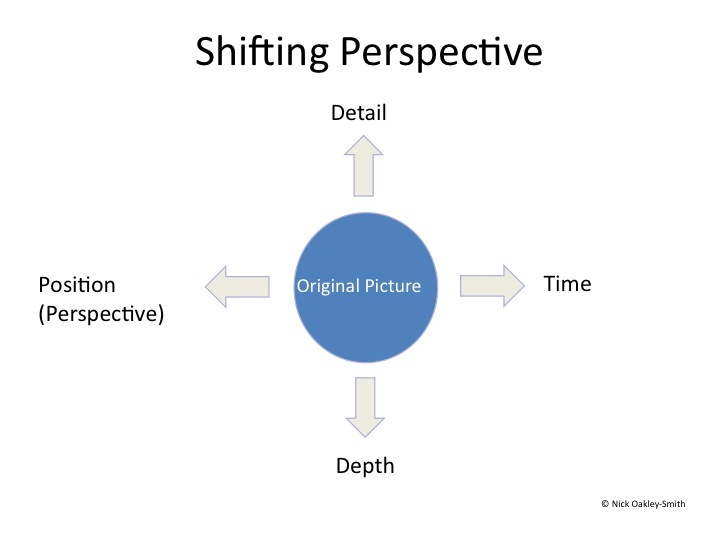 This model was about the process of helping people make shifts in awareness or change perspective. What I was thinking about was that there are four different ways (there are almost certainly more) that we can shift people’s focus. One is to change the time-frame. For instance, where people are struggling with a new role or change of job, I ask them how long they think realistically it will take them to make the transition. Often, they respond by saying eighteen months or a few years. Simply realising this puts all the anxiety and pressure to perform and prove themselves into perspective and they become aware that the problems they are currently facing are not of such importance or scale of impact as they were thinking. Their focus and perspective broadens out and they relax. Thinking about our death as Don Juan advises in the Carlos Castaneda books or keeping the long term goal in mind in relationship as the I Ching advises in the Marrying Maiden (Hexagram 54) – the superior man understands the transitory in the light of the eternity of the end (by anyone’s reckoning the eternity of the end is a pretty long time frame!) . The next dimension is depth. Here it is often about exploring more deeply what people are learning or is really going on in the situation. Usually this shifts the focus away from other people and events to the individual themselves and the external factors become catalysts or challenges for their own learning. I find that almost any situation can be seen differently once we see it as a challenge from which we are learning. Thirdly is detail; when we are stuck in a black hole, we tend to generalise or distort experience and so we lose sight of indicators that things might be different. We use words like “always” and “never” and make definitive statements. Often it will be about other people, e.g. he is always criticising me. Often asking people questions to get under the generalisation helps shift their perspective. “So when you say he always criticises you, have there been any times when he has been positive?” “What exactly does he say? Give me an example.” “What do you think he is thinking or his intention is?” Suddenly the fixed or closed picture shifts to a richer one with more possibilities and options. Lastly, there is position or perspective itself. This entails helping people put themselves in other people’s shoes to see the world through their eyes so that they are able to see themselves or other people differently. It might also be imaginary positions – “What does the wisest part of you say?” “What is your heart telling you about this situation?” It might be describing or reflecting back to the individual how the other person could be feeling about the situation, eg. “It sounds like they are worried” or “It sounds like they are under pressure” or “It sounds like they are anxious about how to respond to you”. You can also use stories or experiences from your own learning as a different position. I think one of the most valuable here is to consider what the Universe or Life might be teaching them. The point is not necessarily that we know, but for the individual to see that there might be more at play than only themselves and considering a broader perspective puts their own drama in context. We can even be very clever and creative in the way we manipulate others into breakthroughs using these dimensions. Of course one word of warning in this context; it goes without saying (well clearly not since I am saying it…) if you are going to manipulate others, you had better be sure it is genuinely for their benefit rather than to satisfy your own agenda. In any event the important and lovely paradox here is that you cannot shift anyone else’s perspective, only they can shift it. So providing individuals with lots of solutions and actions to take or your own insights is of no value unless it generates an insight for them. The key for me is that if there is no shift in the way someone sees their situation then nothing will change. In this sense focusing on action or options is of little value, similarly once someone’s perspective has genuinely changed you can trust that they will act differently without having to do anything further. From my experience working on coaching programmes, what trips people up in coaching or in trying to help others is that the person trying to help or coach the individual accepts the picture or frame of reference that the person presents. If you do this, then you can be of no value to the individual, you will be as stuck as the individual and the solutions you try to generate will leave them as stuck as they already are. This has always been my concern with NLP practitioners. In many cases their focus is to use techniques to help people achieve their goals without questioning whether their initial assumptions or picture behind these goals or even the goals are valid. This certainly seems to be the opposite of what Milton Erickson was doing. His whole focus was on shifting people’s perspective, not so they could achieve the original goals of their personality – wealth, ambition, everlasting happiness, faultless brilliance, in essence becoming a super being who can get whatever they think they want or need but rather shifting their perspective so they became more aware of themselves and their true motives. The more I think about this, the more I see this issue is Mars and how we use it. If we use Mars to see creatively and gain perspective then the actions we take will bring fresh, positive energy from the heart into the situation. It will open up and expand the creative possibilities. If we simply focus on action without the creative work to see differently then our actions are likely to lead to frustration and further complications. In such times of Shock, presence of mind is all too easily lost: the individual overlooks all opportunities for action and mutely lets fate take its course. But if he allows the shocks of fate to induce movement within his mind, he will overcome these external blows with little effort. When a man has thus become calm, he may turn to the outside world. He no longer sees in it the struggle and tumult of individual beings, and therefore he has that true peace of mind which is needed for understanding the great laws of the universe and for acting in harmony with them. Whoever acts from these deep levels makes no mistakes.